The authors say that despite its proven necessity, networking is scarcely taught in business schools, and their self-study course aims to fill the void with a self-assessment test and 52 weeks of assignments to beef up networking skills. Learn how to reach quality prospects, leverage your contacts, motivate ongoing referrals, track your success, and so much more! Take the self assessment in this book to be powerful at growing your business, connecting with influential people, and turning small talk into big opportunities. In the spirit, style, and format of the bestselling Little Red Book of Selling, the country's #1 sales trainer, Jeffrey Gitomer, offers a fresh take on networking and connecting your way to success. Writing for job seekers and career builders alike, networking superstar Diane Darling shows how to cultivate a rich network of professional contacts and use it to find success. A practical and entertaining guide that will help anyone supercharge their communication skills and consistently make a positive impression on others. 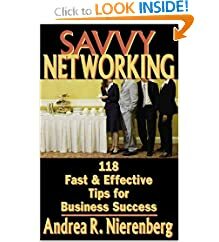 In this her third book, Andrea breaks all the universal rules down into daily tips for effective networking--for all types of businesses from manufacturing to financial services, from technology companies to retailers.